I got an e-mail from Wouxun this morning. 5. 8 Groups scrambler plus 2 groups customized scrambler"
They also mention a new HT. 1.Dual band, dual standby, simultaneous reception: UU, VV, UV or VU. 3.Customized CTCSS; DCS encoding/decoding(Including 105 groups standard DCS and 50 groups normal CTCSS)"
Hmmm... If it'll TX SSB on 10m & 6m, then I'd probably go for it. IF they learned from feedback from the 920. I'm with you on that one, it needs SSB! 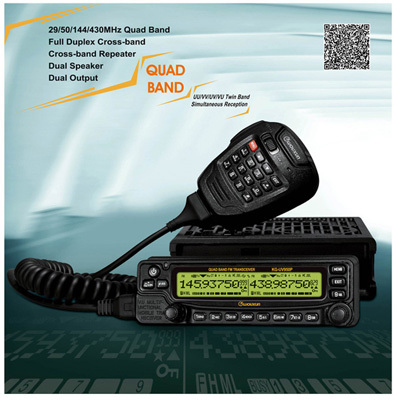 I think the price will be around $430-450, it needs to compete with Yaesu's FT-8900R at $449 with a $50 off rebate. Did Wouxun tell you if this rig will be capable of SSB on the 10 and 6 meter bands? I'kk go for it right now! For me, it's a simple way of keeping track of my repeaters on 10, 6, 2, and .7 meter bands! I wished it also had 1.25 meter then I can use one radio to monotor all five repeaters!